The central focus of St. Josaphat Church is the High Altar Holy Tabernacle. Behind this Tabernacle are three shields that remind of the occupied and partitioned Polish Commonwealth. Pope Pius IX ordered special prayer for those in this persecuted Catholic alliance. After the failed 1863 Uprising, millions of Poles fled to avoid death marches to Siberia. At the same time, Pope Pius IX began the Canonization process for St. Josaphat which completed in 1867. Archbishop St. Josaphat had been martyred in 1623 for uniting Christians of these lands under The Holy See. By 1872, so many Poles had arrived in Detroit that St. Albertus parish was founded for their worship needs. An automotive industry was years away but Detroit had diverse advanced industries and the Polish American community continued to boom. Some worshippers had to travel east and cross railroad tracks resulting in a young girl’s death; an additional parish was requested. In 1889, west of the railroad tracks, land was donated and St. Josaphat Parish was established to serve the expanding Polish population. St. Josaphat was a daughter parish of St. Albertus Parish which donated and relocated their old rectory to be the first rectory of St. Josaphat. The first St. Josaphat building was a combination church, convent, and elementary school staffed by Polish Felician Sisters. The main altar from the first church is now the West Transept Altar (St. Anthony Altar during the 20th Century; now the St. Casimir Altar). The first few pastorates at St. Josaphat were very brief. Then in 1891, Fr. Jan Rzadkowalski, a teacher at the nearby SS. Cyril & Methodius Polish Seminary, became pastor. During his long tenure, he built a complex beginning with a new church in 1900. A reproduction painting of Our Lady of Czestochowa was commissioned and touched to the original in Jasna Góra. This holy relic has hung on the high altar for well over a century. Above the painting, angels hold a crown emphasizing the fifth glorious mystery of the holy rosary, the coronation of Mary as queen of heaven and earth. The three shields below the painting represent the Catholic commonwealth of three countries - Archangel Michael for Ruthenia, Eagle for Poland, and Knight for Lithuania. To Archbishop St. Josaphat they may have represented the Union of Brześć in 1596 when Ruthenian Rite Orthodox Bishops came into Communion with The Holy See of St. Peter, Bishop of Rome. St. Josaphat was martyred evangelizing and implementing this union. St. Josaphat’s tomb is the base of an altar in the Gregorian Chapel of St. Peter’s Basilica, Vatican City. 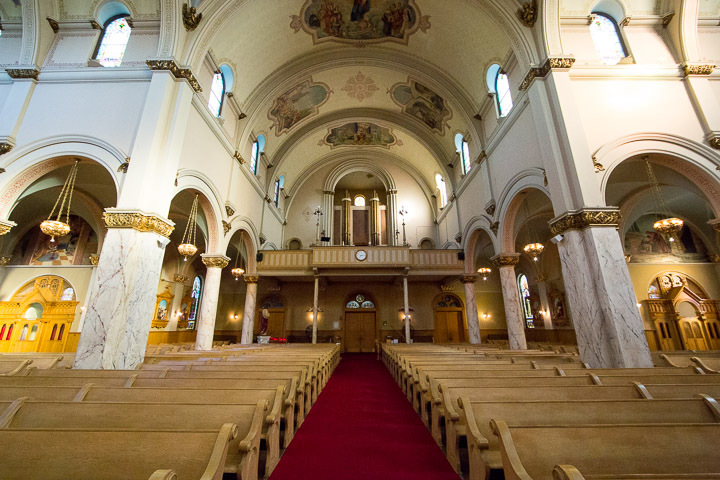 When St. Josaphat Parish was founded in 1889, the three shields’ countries existed only in Catholic churches and the faith and hearts of the worshippers. Fresh in their minds was the unsuccessful Uprising of 1863 for liberation of these countries. Many Heroes of Faith emerged from that uprising exemplified by St. Raphael Kalinowski. Under the three shields is a scroll with “Hail Mary Full of Grace” written in Polish. Inspired by the 1899 encyclical of Pope Leo XIII Annum Sacrum (on Consecration to the Sacred Heart), a Sacred Heart rose window was placed in the east transept. The east sanctuary side altar was that of the Sacred Heart of Jesus during the 20th century; now it is the St. Joseph altar. The largest sacramental steeple bell is named St. Leo. The medium and small steeple bells are named St. Peter and St. Paul, respectively. During the Consecration and Transubstantiation, you will hear SS. Peter and Paul ring out to the neighborhood. In 1915, Pastor Rzadkowalski passed into eternal life, and the chaplain of the nearby Felician Motherhouse, Fr. Joseph Lempka, became Pastor. He established St. Josaphat High School which soon became accredited by the University of Michigan. The two murals in the front of the church are called the Miracle on the Vistula and Prayer Pilgrimage to Częstochowa. During World War I, St. Josaphat Church (called a garrison church and Twierdza Wiary i Polskości “Citadel of Faith and of Polish Patriotism”) was the final USA stop for Polish Americans before crossing the Detroit River to Canada and joining Haller’s Blue Army. Many volunteers were St. Josaphat parishioners. “On October 14, 1917, a special mass was celebrated in our church for 147 volunteers. These men left the USA to serve in the Polish Army, fighting their way through France to Poland.” (vestibule plaque). St. Josaphat's mural of Cud and Wisla (Miracle on the Vistula) includes Polonians in blue uniforms and commemorates the Blessed Virgin Mary's apparition and resulting victory on August 15, 1920, the feast of the Assumption of Mary. Pope St. John Paul II was born just three months before the Miracle on the Vistula. Ten days before the Miracle, Pope Benedict XV asked all bishops of the Catholic world to pray for ‘God’s mercy for unfortunate Poland.’ The Pope stressed that the whole of Europe was endangered. On August 15, 1920, unlike most dignitaries the Papal Nuncio, Cardinal Ratti, did not flee and said that Warsaw was as good a place as any to die a martyr for the Church. Cardinal Ratti was spared martyrdom, and went on to become Pope Pius XI; as Pope he promulgated the encyclical Ecclesiam Dei (On St. Josaphat) on November 12, 1923. During the 1960s, instead of modernizing the church, Pastor Fr. Francis Dolot began an extensive restoration. His pastorate culminated with our registries as a Michigan and National Historic Site. In 2003, Administrator Fr. Mark Borkowski began another restoration, attributed the St. Josaphat longevity to the intercession of Our Lady of Czestochowa, and instituted a perpetual novena to her every Thursday after Noon Mass. 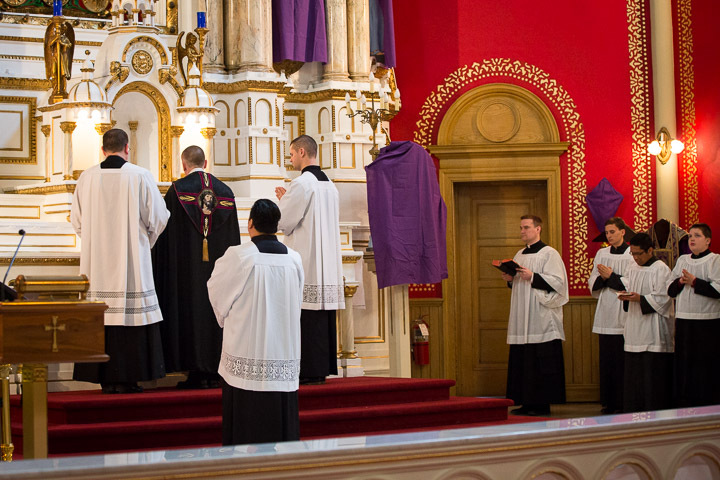 In 2004, St. Josaphat began to celebrate a regularly-scheduled Tridentine (Extraordinary Form) Mass, at that time the only one in the Archdiocese of Detroit. In 2013, St. Josaphat became part of the newly established Mother of Divine Mercy Parish. In November of 2013, a storm badly damaged St. Josaphat's steeple. After ten months, the repair and restoration of the steeple was complete, and the church reopened on September 13, 2014. The Detroit Free Press and The Michigan Catholic reported on the reopening Mass celebrated by Auxiliary Bishop Francis Reiss. The St. Josaphat steeple was featured in a detailed article in the May 2015 issue of CAM (Construction Association of Michigan) Magazine. St. Josaphat Elementary School opened in 1890. It is not known precisely how many students were enrolled that opening year but it has been recorded that 100 students received First Holy Communion in 1890. The number of classrooms was quickly expanded during the 1891-92 school year as well as in the years that followed. The elementary school reached its peak enrollment of 796 students in the 1912-13 school year (and again reached 790 in 1923-24), which would have amounted to about half the enrollment at the nearby Polish Catholic schools of St. Albertus and Sweetest Heart of Mary (which reached enrollments of 1600 students). St. Josaphat High School began with a ninth grade class in 1915, twenty-five years after the opening of the elementary school. But it would be the 1925-26 school year before the high school had a full compliment of grades and its first graduating class. This was due to the deterioration of the surrounding neighborhood and the need to build more structure to house the high school students. Peak enrollment at the high school reached 150 students during the 1931-32 school year and diminished rapidly after that. The decline in enrollment parallels the exodus of members from St. Josaphat parish due to deterioration of the surrounding neighborhood. In spite of its small enrollment, the high school offered a good education including the following academic areas: religion, language, science, mathematics, social studies, and business-secretarial. The fact that the high school program at St. Josaphat was continually offered accreditation by the University of Michigan is evidence that it provided its students with a high quality education. In 1942, the high school tuition was $2.00/month. It was raised to $2.50/month in 1945 and to $3.50/month in 1956. Both St. Josaphat Elementary and High School closed in 1960. At that time, the cost of the high school tuition was $4.00/month.